Physical characteristics: Rufous treecreepers have faces that are cinnamon-rufous, reddish brown, with rufous brows, and cheeks that have a black eye stripe. Their undersides are rufous with white streaks for the female, and black with white streaks on the male. Their upperparts are gray-brown. Their length averages 6.7 inches (17 centimeters). These birds weigh between 1.1 and 1.2 ounces (30 and 33 grams). Geographic range: Rufous treecreepers can be found throughout southwestern Australia and on the Eyre Peninsula of South Australia. Habitat: Australian treecreepers live in eucalyptus forest and accompanying woodland, and in the mallee, dense thickets formed by various shrubby species of Australian eucalyptus. Diet: Rufous treecreepers, like other species of Australian treecreep-ers forage for their food along the trunks and lower branches of eucalyptus and casuarinas, and on the ground. They are primarily insectivores, with ants as their preference; but also eat centipedes, snails, small reptiles, and seeds. Behavior and reproduction: The rufous treecreeper lives in family groups that are made up of the breeding pair and its offspring from previous breedings. They tend to be sedentary, and make peeping and churring calls at their predators. Their voice is like the brown treecreeper with short, staccato notes and harsh rattles, with chuckling songs, but they are higher in pitch. This bird has a breeding season from August to January. Their nests, like those of other Australian treecreepers, are built deep into the hollows of tree branches, stumps, and fallen logs. 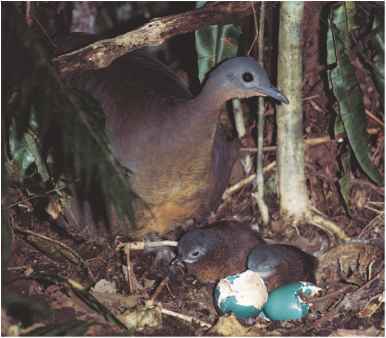 A clutch has one to three eggs that the female incubates for seventeen days. The young are fed by both parents, and by helpers, usually the young of previous breedings. At twenty-six days they fledge with a great success rate—one study in western Australia showed that 78 percent of attempts succeeded. Rufous treecreepers and people: There is no known significance between rufous treecreepers and people. Garnett, S. T., and G. M. Crowley. The Action Plan for Australian Birds 2000. Canberra, Australia: Environment Australia, 2000. Higgins, P. J., J. M. Peter, and W. K. Steele, eds. Handbook of Australian, New Zealand and Antarctic Birds. Tyrant-flycatchers to Chats, vol. 5. Melbourne, Australia: Oxford University Press, 2001. Sibley, C. G. Birds of the World. On diskette, Windows version 2.0. Santa Rosa, CA: Charles G. Sibley, 1996. Sibley, C. G., and J. E. Ahlquist. Phylogeny and Classification of Birds: A Study of Molecular Evolution. New Haven, CT: Yale University Press, 1990. Simpson, Ken, and Nicolas Day. The Birds of Australia. Dover, NH: Tan-ager Books, 1984. "The Demography and Cooperative Breeding Behaviour of the Rufous Treecreeper, Climacteris rufa." Australian Journal of Zoology (December 2001): 515-537. "Austral-Papuan Tree-creepers." Treecreepers, Lyrebirds, Bowerbirds and Fairy Wrens of the World. http://camacdonald.com/birding/Sampler6_ TreecreepersLyrebirdsBowerbirdsFairyWrens.htm#Treecreepers (accessed on June 18, 2004). "Australian Treecreepers, Climacteridae." Bird Families of the World. http://www.montereybay.com/creagrus/treecreepers.html (accessed on June 18, 2004). "Australian Treecreepers." Birds of the World. http://www.eeb.cornell. edu/winkler/botw/climacteridae.html (accessed on June 18, 2004). "Rainforest understory." Rainforest Education. http://www .rainforesteducation.com (accessed on June 18, 2004).